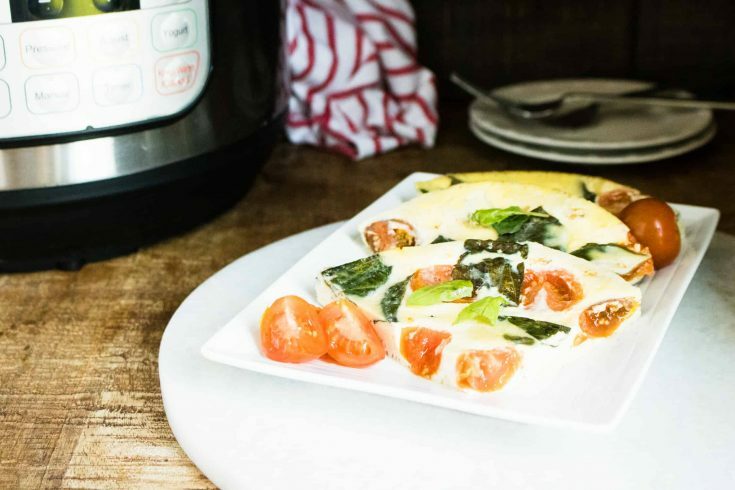 This delightful Instant Pot Caprese Frittata Recipe just may be your new go-to Instant Pot meal! 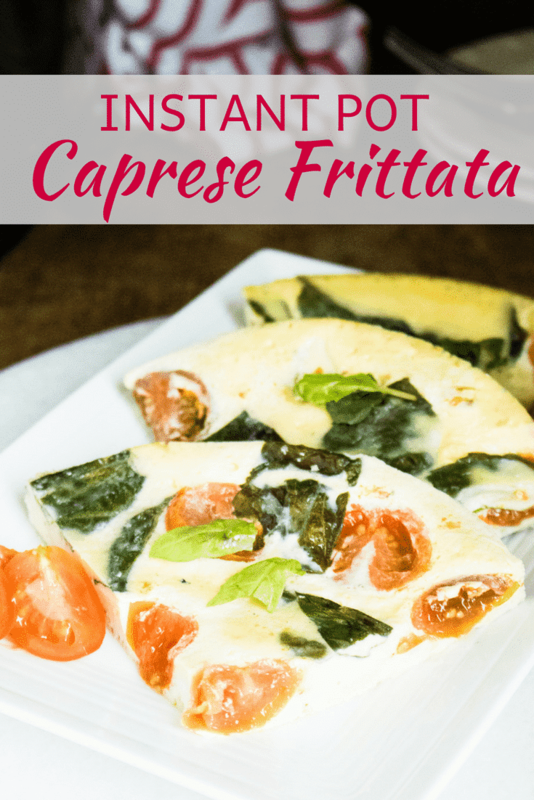 It combines the delectable flavors of the infamous Caprese salad with everyone’s favorite brunch entrée, the frittata. 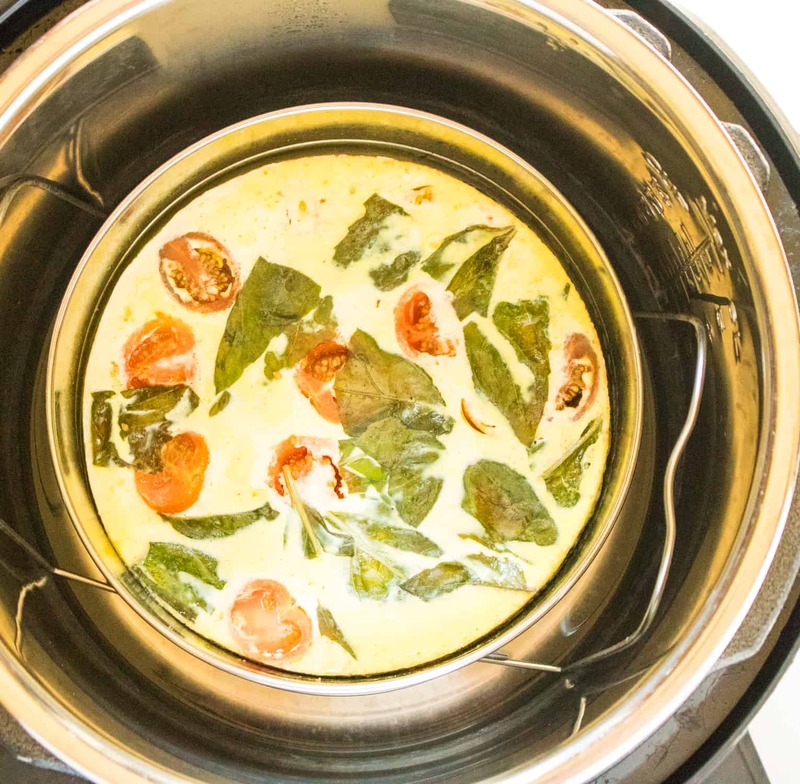 And, since it’s made in the Instant Pot, it is incredibly quick and easy to make. Simply combine the ingredients, set it, and walk away! The Caprese (which in Italian literally means “of Capri”) salad originated in the 1950s in the Isle of Capri, located in the Campania region of Italy. Traditionally, Insalata Caprese is made with cow’s milk mozzarella, tomatoes, and olive oil, then garnished with oregano and arugula. 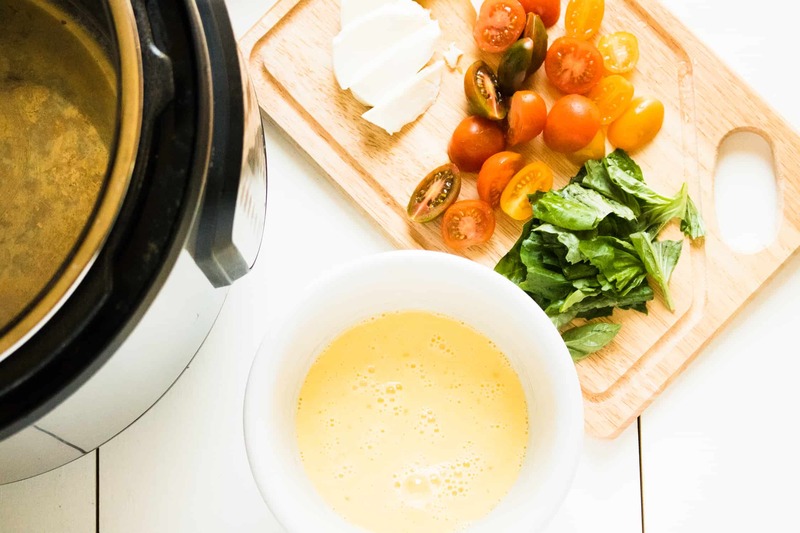 Our Instant Pot Caprese Frittata Recipe swaps in fresh basil for a subtle peppery flavor that is also slightly sweet, and aromatic. And the addition of parmesan cheese provides a nutty, savory depth of flavor. To make a frittata, the filling ingredients are combined with the beaten raw egg mixture, as opposed to having the filling ingredients laid over the mostly-cooked egg mixture and then folded in half. The egg mixture for a frittata is beaten vigorously to incorporate more air. This makes a frittata taller and fluffier than omelets. While omelets are typically made as individual portions for one person, a frittata is larger and sliced (like a pie) so that is can serve many people. Using an aluminum foil sling to make the sometimes difficult task of removing a hot, slippery pan from the Instant Pot much easier and safer. Make the sling: tear off a 2-foot piece of aluminum foil from the roll and fold it into thirds. Place your baking pan on the center of the strip of foil. Then, fold or roll the sides of foil to reach the top edge of the baking pan. To use the sling: Hold the sling and the top edge of the pan (to stabilize it) while you lower it into the Instant Pot. When it’s time to remove the pan, simply unfold the sides of the sling and, being careful not to touch the sides of the Instant Pot, slowly lift the pan out. Using a thin pair of oven mitts, like these silicone pinch mitts is a great way to make sure your fingers stay safe. Place a metal trivet in the bottom of the Instant Pot, and pour in 1 cup water. Spray an 8-inch round baking pan with cooking spray. 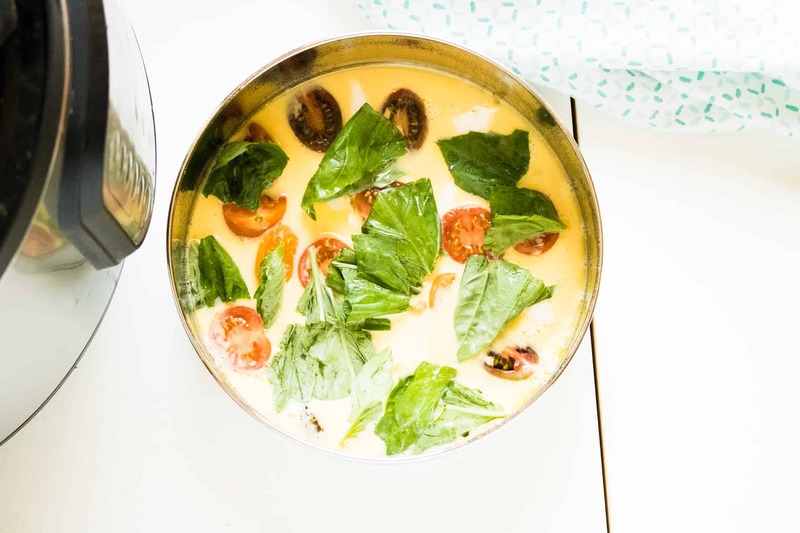 Next, whisk together eggs, milk, salt, and pepper, then stir in parmesan cheese, halved cherry tomatoes, mozzarella chunks, and chopped fresh basil. Pour the mixture into the pan. Lower the pan on top of the trivet, close the lid, and turn valve to the sealed position. Once the cooking time is over, allow for a 10 minutes natural release, then perform a quick release. Remove the pan, and then turn out the frittata onto a serving plate. Slice, then garnish with more fresh basil and cherry tomatoes, and it’s ready to serve! Place a metal trivet in the bottom of the Instant Pot. Pour in 1 cup water. 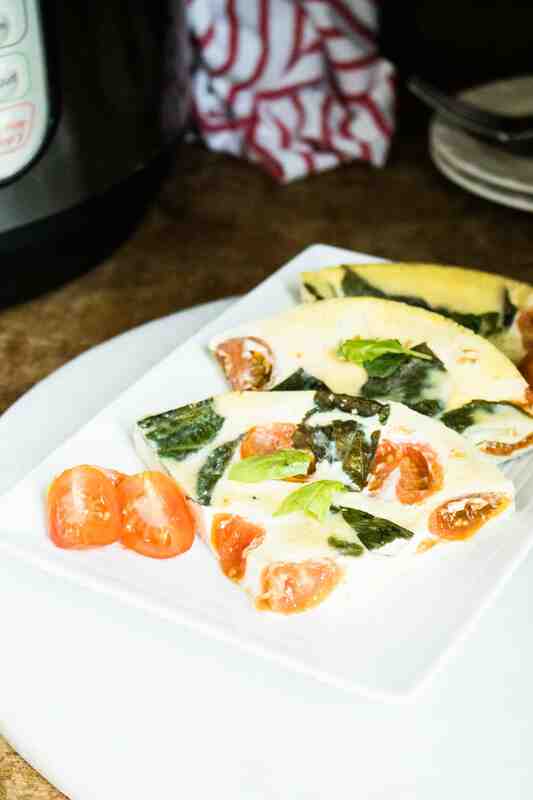 Whisk together eggs, milk, salt, and pepper, then stir in parmesan cheese, halved cherry tomatoes, mozzarella chunks, and chopped fresh basil. Pour mixture into pan. Close lid and turn valve to the sealed position. Set to manual high pressure for 25 minutes. When cooking time is over, allow for a 10 minutes natural release, then perform a quick release. Remove pan and turn out frittata onto a serving plate. Garnish and serve.